Growing up in the 1950s and ’60s in the United States, where right-wing scoundrels turned patriotic symbols into political cudgels, left me with a lifelong aversion to flags, ribbons, lapel pins, and other obligatory trappings of national fealty. When I moved to Canada, this aversion morphed into a disinclination to wear poppies. As best I can tell, most Canadians see the poppy as a neutral symbol of respect for veterans. Social pressure to wear it is strong. Acquaintances and strangers alike view my failure to fall in step as inexplicable, disrespectful, and distasteful. I regret this. After years of attempts to explain my position, I mostly avoid the conversation today, and I regret that, too. I can only offer the hope that the occasional outlier’s refusal to adopt mandatory, state-sanctioned idolatry is healthy for democracy. Kill 10 million boys pointlessly. Honour pointlessly killed boys with anti-war Remembrance Day ceremonies. Label those opposed to war as anti-veteran. Anti-veteran = anti-troop = unpatriotic. I wear a poppy religiously, to the point that, thanks to the crappy pins they use on them, I think I have bought half-a-dozen this year. It is not because of social pressure, but because I grew up doing it, and it feels right. My family was a veteran’s family, and most of my parents’ friends were vets as well. They were lucky, since few of them had been at the “sharp end,” and did not have to wear the emotional effects of combat. That was for my high-school physics teacher, who did a tour on Halifaxes with 6 Group, and was a shadow of a man. I don’t share all your views on this issue, but I certainly understand and sympathize with them, and Bousquet’s points are not without merit. I wish they were not. I can’t put on the poppy without thinking of the waste of life these wars have caused, and the utter pointlessness of it. In attempting to explain why he doesn’t wear a poppy, Tim Bousquet takes the worst possible reasons one could have for wearing one and assumes that everybody wears them only for those reasons. World War 1 was a colossal waste of life and a pointless war. World War 2, while also a colossal waste of life, at least served a purpose for fighting back against tyranny. War is not a glorious endeavour, but a sometimes necessary evil. One of the things that soldiers fought and died for was the freedom that you, Tim, and I enjoy to choose to wear a poppy and to write columns and blog posts without fear of retribution. If you eschew the poppy because it is against your principles, I hope that you and Tim at least recognize that young men died in a war to preserve that freedom. I’ve never fought in a war and I don’t know any veterans, but I have three sons who are the same age as many of the young men who went off to fight in World War 2. I know that a generation made a huge sacrifice and I appreciate that. That is why I wear a poppy and always will. As someone who lived in the U.S. for some years, I certainly applaud your point of view on many symbolic gestures which in reality are confusing at best and meaningless at worst. But jingoism is not the same as respect and remembrance of sacrifice. It is in this spirit I wear the poppy. In the very same spirit, I respect your decision not to. 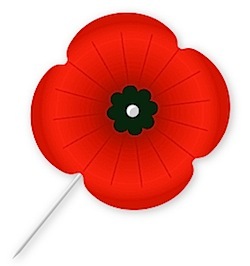 I respect your opinion on wearing, or not wearing, the poppy, as I am sure many veterans do as well. I try to wear one but often lose it or don’t have money with me when I see them available, or I hand mine to someone else who “needs” it for a particular situation. Regardless, it is a personal decision and a personal choice. The problem that I have with your position (and Tim’s) is that it is as political as the very reason you state for not wearing it. It is the Yin to the Yang in the argument. The poppy is not political. It is very simple. It is to remind us of individuals who died, often in tragic, horrible, and often very lonely situations. Some of them were in that situation knowing full well why. Some were there because they were lied to and some didn’t understand why they were there but were told it was the right thing to do. I see it as being similar to the ceremony in Berwick for Harley Lawrence. No one was there to make a statement about mental health or homelessness or anything else. They were there simply to honor a fellow human being who died in a tragic, horrible and very lonely situation. It is too easy for us today to assume ulterior motives and become cynical about everything around us. For me, the poppy is a sanctuary from that to a simple and basic compassion for another person’s sacrifice and loss. It can be very liberating and comforting if you allow it to take you there, but don’t feel you have to let it.